so is one of my family members who mentioned that she was going to do her friends wedding invitations for her to save some money!! and you will be surprised at what we found. We went to our local craft store and hunted for supplies for one of our most popular invitations, Coastal Chic DL Invitation. To sum up our shopping trip in one word – Frustrating! It took professional stationers 20 minutes to find the cardstock at the end of an aisle. Then to decipher the prices on the ribbon chart was a nightmare. Plus some of the items were not available in-store so we had to search online. If you went shopping on our website you would have added 50 Coastal Chic DL Invitations to your shopping cart and paid a 50% deposit. We would require you to send us your guest list in Excel format. 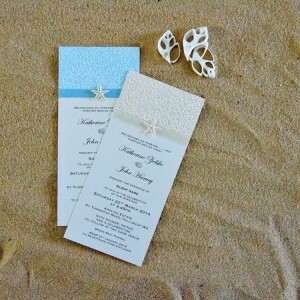 Your font choice and wording for your invitation, (which we will provide and have plenty of suggestions to show you). Then the best part… we take care of the rest!! All this for $197.50. This means that you are only paying approximately $22.50 for supreme quality products, personalised printing, oh – and a lot less stress. Needless to say, we are doing to the friends invitations now, because my family member realised the time and cost involved. 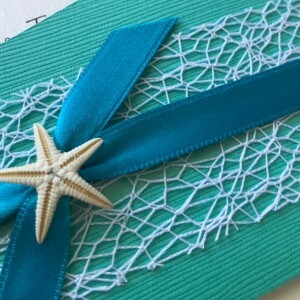 This entry was posted in Beach Weddings, General Wedding Saving Tips, Invitation Making Ideas, Invitations & Stationery and tagged #centralcoast, #invitations, #showroom, #smallbusiness, #weddingstationery, Beach Theme Wedding wording, Budget and Money Saving Tips, colour ideas for weddings, diy, DIY Invitations, Invitation money saving tips, Wedding Theme Ideas, wedding theme inspiration.